I'm back from a two week vacation, and today I'm discussing the merits and problems with exclusivity and free ebooks with Blake Crouch, and his brother Jordan. 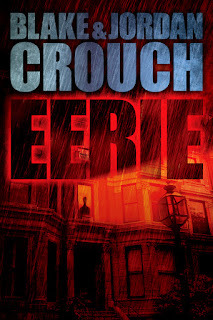 Blake and Jordan have a new ebook horror-thriller out called EERIE, which is currently free on Kindle. Download it. It's a great book. For the sake of experimentation, EERIE didn't debut on Kindle. In fact, it has been available for several weeks. Here are the Crouchs to explain why. JORDAN: Blake and I shared a room for five years while we were growing up. Bunk beds, one closet, and a single dresser. When our father finished the basement, he built a second, even smaller bedroom with no windows and a door that locked, behind which my older brother disappeared and was never heard from again. Twenty years later we find ourselves sharing another space. This time, it's the page. I guess it should come as no surprise then, that our first book together is about siblings trapped in a house. EERIE [free on Amazon today] follows an estranged brother and sister as they try to uncover the mystery of the violent presence that inhabits the upstairs bedroom. 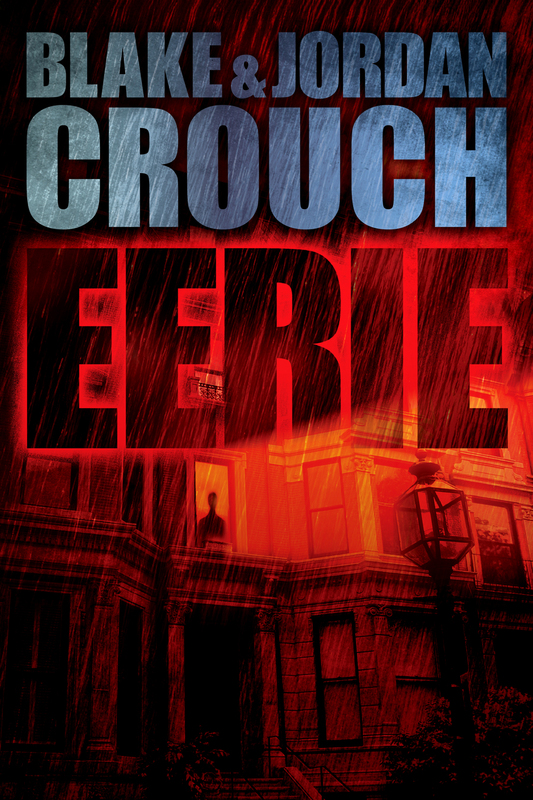 From newcomer Jordan Crouch and Blake Crouch, author of the Top-10 Kindle-bestsellers Run, Stirred, and Fully Loaded, comes Eerie, a chilling, gothic thriller in the classic tradition of The Shining and The Sixth Sense. Although I’ve been writing for close to ten years now, it’s always been as a personal outlet, not a serious professional endeavor. I’m really excited to say that’s about to change. This book represents a lot of firsts for me. My first novel, my first collaboration with Blake, and my first foray into self-publishing. So in the spirit of the blog, I'll talk about the experience with the collaborative process as the Newbie that I am. I've read Blake's stuff for as long as I can remember: the good, the bad, and the humiliating high school creative writing projects. It’s not lip-service when I say that he’s one of my favorite writers. So, when the opportunity to work together presented itself in November of last year, it was an easy decision. We already had the basic idea for what would become EERIE, and over the next few months, we sequestered ourselves inside a Google Doc and hammered out the first draft. If you've never used Google Docs before, here's what you need to know: it's a word processor that allows multiple users to edit the same page in real time. Like a big dry-erase board. As a collaborative tool it’s great, but for two brothers, it’s the creative equivalent of sharing a room again. There's nothing more humbling than watching a sentence you just carefully arranged disappear word-by-word and be replaced by another thought entirely. That's the license we agreed to give each other. If something felt wrong or lacking or just plain stupid, strike it. Sometimes it hurts, but the price of collaborating is giving up a certain amount of control. Of course, that's easier said than done, and diplomacy did not always prevail. But on the few occasions when we resorted to the nuclear option, we always ended with something better than we had before. Writing is an intensely personal endeavor. If you can make it work with someone else, it’s awesome. If that person is your brother, well that’s pretty special. BLAKE: This was my fourth collaboration. I've written extensively with Joe, and then with Joe, Jeff Strand, and F. Paul Wilson, for Draculas. I collaborated with Selena Kitt on our short story Hunting Season. But this was different. My brother has been a writer for a long time and got a degree in creative writing from UNC-Wilmington. I'd always wanted to collaborate with him, because he's one of my most important sounding boards in the writing process. We finally hit upon an idea we were both very excited about, and though there were some speed bumps along the way, we persevered, and are immensely proud of the final product. It's essentially a monster-under-the-bed story, something that plays upon every child (and inner child's) greatest fear. I've rambled on at length on this blog about collaboration, so I thought I'd share my experience on EERIE from the perspective of its publication. For EERIE's initial release, Jordan and I decided to try the Pubit! Nook First program. This is Barnes and Noble's interesting take on exclusivity wherein, by invitation, they offer you merchandising and promotion in exchange for releasing a new work straight to their platform for a 4-week period. After that period, you're free to publish everywhere. I don't know what other writers' experiences with Nook First have been, but for the most part, Jordan and I were pleasantly surprised. We sold about 1500 copies of EERIE (@ $3.99) in May for Nook, which I know is far more than we would've sold on Barnes and Noble on our own. There were some disappointments, however. Despite huge sales on a handful of days, our sales rank was wonky. It never seemed to correlate to a corresponding low rank. Even on days where we sold 400 books, our rank never dropped below 2000. I have no doubt this cost us many, many sales, a good chunk of money, and kept the book from every appearing on the BN bestseller lists. A real shame, because the marketing triggers that Pubit! pulled worked in a big way. The tech just wasn't there to support them, and their tech support staff just couldn't be bothered to give a damn. But that aside, Pubit! clearly has some real marketing power, and the smaller window of exclusivity (as opposed to KDP Select's 90 day commitment) is a definite plus. When Pubit! 's tech support decides to follow the model of Kobo and Amazon and treat writers as customers instead of entities to be ignored, Pubit! could become a force. Also in May, I had the opportunity to drop my best-selling title RUN into a Kobo promotion involving email blasts, coupons, and prominent placement on their landing pages. I could not have been more pleased with the results. RUN reached the top 10 on Kobo's overall list, stayed there for several weeks, and the rest of my catalog sold well in response. When you consider the size of Kobo's market share, the fact that I sold more books on Kobo in May than I did on Pubit! is astounding. It was only a few hundred dollars shy of beating Amazon for May, and it did beat Pubit! again in June. Even better, Kobo did not request exclusivity. Their writer-relations people are some of the friendliest, most proactive, responsive people in the business. Suggestions and requests I made last year were taken to heart. It's no secret that Kobo is on the verge of unveiling their own platform (Writing Life). If there is a company that could one day compete with the mighty Amazon, it's these guys. They're inventive, have far, far reaching plans to bring writers what could become the slickest digital publishing platform ever created, and they get that writers are customers. They listen. Best of all, my titles continue to sell and rank highly on Kobo's bestseller list, a month after the promos ended. I cannot say the same for Barnes and Noble. There is no other platform (aside from Amazon) where I've seen this level of "stickiness." If someone asked me what's keeping the majority of my titles out of KDP Select, I would have to say these guys. KDP Select opinion pieces are a dime a dozen. Amazon is still, hands down, the most lucrative platform for me. Even though the transition from free to paid sales appears to have weakened as of late, success stories like Ann Voss Peterson and Robert Gregory Browne are convincing enough for my brother and I to roll the dice and drop EERIE into KDP Select. I say this as someone who has had great success with free titles: they still make me nervous. I get the excitement of giving away 70,000 ebooks. The prospect of making new fans. But free, in the long run, is dangerous. It sets a bad precedent and level of expectation in the minds of readers. Am I a hypocrite for saying this while EERIE is free? Maybe. But if all the platforms did away with free, I'd be okay with that. As writers, we cannot keep going to that well. It will dry up. Kindles may be able to hold a gazillion ebooks, but readers can't read that many. The key is not being downloaded. It's being read. This post is not going to end with a definitive conclusion on freebies and exclusivity. I'm uncomfortable with both concepts, even as I play the game. My sense is that the people who survive and continue to do well selling ebooks will be those who experiment, take risks, and adapt. We've said it before, but what worked yesterday, may not work today, and the possibility of a game changer (like KDP Select) is constantly looming. JOE SEZ: I predicted that ebook retailers would seek exclusivity back in 2009. It's an obvious conclusion to draw when retailers compete. If there is a commodity that people want, and it is only available at one place, they'll shop at that place. The author is the brand. I've lost count of the emails I've gotten from Nook and Kobo ereader owners who are wondering when Shaken and Stirred (both published by Amazon) will be available on their devices. That's one of the reasons my ebooks are DRM free--so readers can convert to other formats like epub to read on devices other than Kindle. So how effective is exclusivity as a sales tool for Amazon? I've had people email me who bought a Kindle just to read Shaken. But how many more of my fans are annoyed because they own a different ereader that doesn't allow for a one-click purchase of Shaken? How many sales are lost? My guess is: a lot. Shaken and Stirred have done well, but Blake and I have done better on self-pubbed projects. For me to be exclusive with a retailer, I have to know the sales I'm going to lose will be made up for with increased sales on the exclusive platform. Long term, that's risky. After the big initial sales push, sales will even out, and years from now the lost sales will really rack up. This is a related dilemma I'm having with foreign sales. My agent has been great in selling foreign rights to my self-pubbed ebooks. But do I want to give up future sales (which I'd have if I kept my rights and translated the ebooks on my own) for immediate sales? I've been nudging Amazon for years to release titles in epub format. Let Nook owners buy my ebooks on Amazon. And let Kindles read epub format. I think that would make more money for everyone. But until that happens, we're going to have retailers jockeying for market share, and one of the ways to do that is to have exclusive brands (ie authors). A lot of people ask me my opinion about KDP Select, and I made it known that I have opted all of my titles out of it. I dislike Amazon's desire for exclusivity, because it limits my readership. Back in January, it was possible for an ebook to be released free on the KDP Select, then bounce over to the Top 100 paid bestseller list. This is still possible, but a lot harder to do, and I'm not sure it justifies removing a title from other platforms to do it. I'm also not sure it does what Amazon wants it to do: lure customers to the Kindle platform. If Amazon wants to sell more Kindles, it should have as many ebooks in the KDP Select program as possible. But when authors like me opt out, that hurts readers. A lot of people also ask me if it is a good idea to sign with one of Amazon's publishing arms. Blake and I hit the #1 Bestseller spot because of the push Amazon gave Stirred, something I haven't been able to do on my own. But was it worth the sales I lost on other platforms? If Amazon wants me back in KDP Select, they'll have to offer more. And if Amazon Publishing wants another book from me, they'll have to offer more. Exclusivity, and signing away rights, isn't how I see the future. Authors should be able to keep their rights, and exploit them in as many ways as possible. I might be missing some important parts of this story. No doubt Amazon is crunching numbers, and they probably know how to find that sweet spot among ebook sales and freebies and Kindle sales and Prime memberships. But I know I'm not the only author they are disappointing, and in the long run that won't be good for them. Like Blake, I'll soon be doing a thing with Kobo, and I hope to replicate his results. I like that Kobo doesn't demand exclusivity. They want to please their customer base and make their website a worthwhile place to shop. That's the line a retailer has to walk. Bringing new people to your online store (and ereader) while also making your current customers happy. Exclusivity might bring in new customers, but it will also irritate your current customers as more and more authors leave the platform. Amazon is THE place to shop online. The shopping experience is better there than anywhere else. They make shopping easy, fast, and enjoyable. It's understandable that they want to sell more Kindles and Prime memberships. It's understandable that they don't want people buying Nooks or Kobos. But if KDP Select was non-exclusive, and Amazon sold epub, that would benefit all authors and all consumers, and irritate nobody. It is in my best interest, as an author, to try as many things as possible, and for many platforms to succeed. I want the whole world to read my ebooks. And I don't care what ereader they read them on, or what store they buy them from. Kobo gets that. Amazon sort of does. B&N, not so much. As I've said in the past, the only two parties needed are writers and readers. The retailer who treats its writers and readers well will flourish. You do this by learning what these groups want. Readers want as many titles available as possible, without DRM, in multiple formats. They want to get ebooks with one-click. They want lower prices, and free ebooks. They want a fun, easy, fast place to shop. They want to have titles recommended to them, either by algorithms or other readers. They want to be able to contact and interact with each other, and with authors. They want to be listened to and have their needs and concerns met. Writers want their work to be available as widely as possible, in multiple formats. They don't want exclusivity. They want to be able to interact with their retail partners and publishers easily and promptly, and to be treated well. They want high royalties, and the ability to control price (including the ability to make their ebooks free). They want data that can help them optimize their pricing and sales, and platforms that make accounting and joint-accounting a cinch. They want to be paid promptly. They want the ability to work directly and outside the box with retail partners and publishers and try new things. They want a stable platform where titles disappear immediately if removed and appear immediately if added, and where sales and rank are updated quickly and accurately. They want more bestseller list categories (like Top 100 Female Police Procedurals Priced at $2.99) and more BISEC categories. They want to be listened to and have their needs and concerns met. A while ago I blogged about about active ebooks. Go read it. This is what authors want. Blake, why the hate for freebies? BLAKE: I don't hate freebies. But why will readers buy ebooks if there are more freebies to download than they could possibly read in their lifetime? JOE: Because that's human nature. We collect. We horde. We buy more than we can ever use. That doesn't mean we reach a point where we stop buying, or acquiring. We all have To Be Read piles. Ebooks have made them easier to attain and manage. BLAKE: More than we can ever use. That's what worries me. If a TBR pile is suddenly 1000 books instead of two dozen, and my book is #899 in the pile, what are the chances I will be read? If someone downloads my book for free, but never reads it, they won't become a fan and buy the rest of my paid catalog. JOE: There are a few things happening here. First, there's a difference between being owned and being read. That difference has always been there (and I say "owned" instead of "bought" to include freebies, and even though ebooks are essentially a licence and not a purchase). We all own more media than we'll ever be able to experience. The whole concept of the "cloud" plays into this. Why own anything if it is all always available to access? But the cloud is still a concept that hasn't entirely caught on. People do like to own media. More people will own us than read us. It'll always be that way. There's no guarantee a book owned will be read, even if that book was bought. Adding more choice to the equation doesn't matter. We've always had a lot of choice. BLAKE: But if I pay money for that book because I heard about it and found it through reviews or whatever, the chance that I'll read it is better than if I just grabbed one of 20 freebies listed on Pixel of Ink. JOE: We read what we want to read, free or not. I've bought $30 Blu-Ray disks that sit unwatched on my shelf for 5 months, and instead I've surfed YouTube for free for 90 minutes. But YouTube didn't stop me from buying. And I'll watch the Blu-Ray eventually. That's a human mentality. We want to be able to access media whenever the mood hits. So maybe we'll stock up on freebies for a rainy day, and maybe that rainy day comes and maybe it doesn't, but I don't see it limiting or hurting sales. We have paper bestsellers because of a lack of choice. Only so many titles can fit on the shelf at Costco. More choice is a good thing. BLAKE: You don't think there's a segment of customers, possibly very large, who have so loaded up their Kindles since Christmas and KDP Select came into being, that they don't actively shop anymore, because they have so many titles they want to read? JOE: You've been to my house. How many books do I have? Video games? Movies? BLAKE: You've got a few. JOE: I've got tens of thousands. And this morning I was on Amazon and I bought 5 new Blu-Rays, two ebooks, and a video game. My rule is: I only use marketing strategies that work on me. Which means I think a lot about my buying habits, and my media habits. While I'm sure there aren't many people out there with tens of thousands of books, movies, and games, I'm also sure the principle of what I'm saying is widespread: having enough doesn't inhibit acquiring more. If someone gets your ebook for free, it doesn't mean you lost a sale. They may not read it, but they might never have bought it either. And people may be downloading a lot of free titles, but not reading them. Free, however, is a way for a customer to try you without any risk. Even if only a small percentage of freebies get read and make readers into fans, I believe that's still worthwhile. BLAKE: So you think the free model is viable for the long haul? You don't think it trains people NOT to pay for books. JOE: You know my belief on this. Eventually, all media will be free, and artists will be paid by advertisers. People can't be trained to pay more. That doesn't work. They'll get it for as little as they can get it for, and that ultimately means free. Rather than fight that, I'm happy to give consumers what they want. So I've made my titles free, I have no issues with file sharing, and I'm looking forward to a future where ads are in ebooks. But that's the topic for another blog. My final point is: don't fight what the customer wants. If customers want free ebooks, give them free ebooks. So far it hasn't hurt my sales, and I don't expect it to. Readers are very good at vetting, at finding what they want to read, free or paid. Our jobs as writers should be feeding those readers in any and all ways that we can. If you find readers, the money will follow.